A boy and a dream. My 5 year old son loves cars, the BUMBLE BEE CAMARO is his absolute favorite. We try to create our own costumes every year. This year my husband has outdone himself! My son's dream came true. 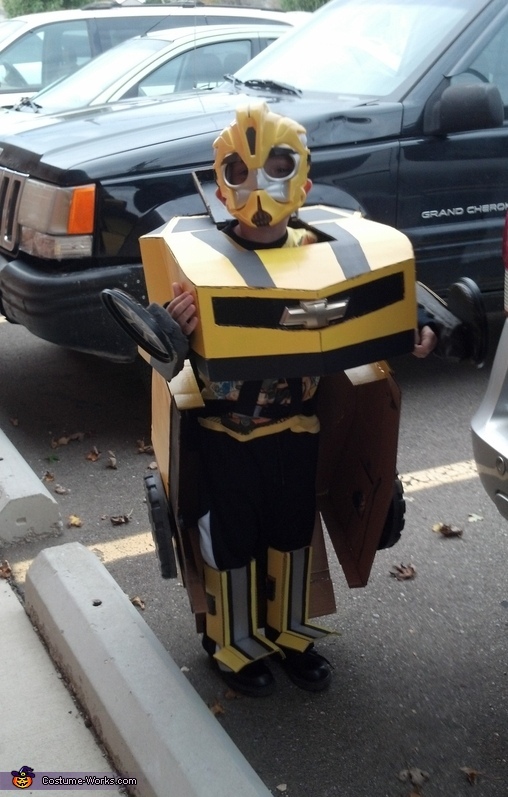 His costume is the Transformers bumble bee camaro and yes he's able to transform. The costme is made of a cardboard box, folgers coffee can lids, some old wagon wheels cut in half, and some paint. My son loves it and it'll make a great toy even after halloween. This has got to be the best costume that I have ever seen. Hand made from cardboard and it transforms too!!!!!! Awesome Job! I would love to make this for my son. Are u willing to share the instructions? I would like to make this for.my son science fair contest would you love to share the instruction? Thank you. I would love to make this for my grandson.